Graphic novelist Leia Birch Briggs seems to be running from problem to problem. She is at her stepsister's side when Rachel's marriage is falling apart. Before they can solve that, she is off to Alabama with her teenage niece in tow to find out what is happening with her beloved grandma Birchie. When she discovers that her grandma has been sick for a long time and Birchie's best friend Wattie has been helping her keep the secret, she is furious. But Leia is also willing to stick around and figure out a solution. After all, she has a problem of her own that is only going to grow: Leia is pregnant, but the only thing she remembers is that the father was dressed up as Batman at the comic convention. I had read one other Joshilyn Jackson book before this one, which frustrated me for plot reasons. I'm so glad I gave her another try because I found this book to be the perfect combination of compelling plot, engaging characters, and a wonderful Southern family story. There's a balance between a light beach read and a story that tackles real issues. It's tough to achieve and books usually fall in one camp or the other. The Almost Sisters is the rare one that can do both. The pages fly by, but the story is dealing with big issues like racism, abuse, and the ways we care for our families. The story is great, but it's really the flawed, endearing characters that make this book so enjoyable. Leia is a delightful protagonist to follow. She definitely doesn't have her life together, but she is doing the best she can and she will fight unceasingly for the people she loves. The relationships in this story were so strong and realistic. Leia and Rachel are stepsisters, but they are a huge part of each other's lives and I really enjoyed the way Leia understood Rachel and worked to come to terms with her choices. Birchie and Wattie have been friends for a lifetime and would be happy to live together and preside over their Southern town for the rest of their days. I loved spending time in Birchville, Alabama with each one of the carefully crafted characters. If Ms. Jackson would like to write a sequel, I would be there in a second. If not, I will be happily enjoying whatever stories she chooses to write. I love Joshilyn Jackson's novels. Not all of them have been great, but almost all of them have been entertaining. I do have this on my list of books to read this summer, and I can't wait! Good to know! I've been thinking about dipping into her backlist. 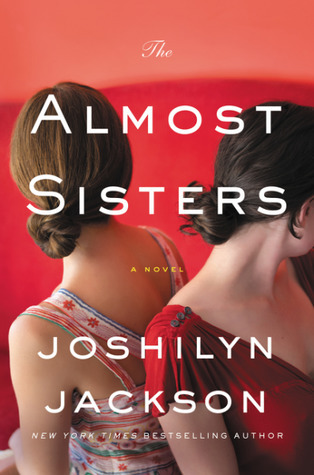 The Almost Sisters is definitely a great summer read! I really enjoyed Someone Else's Love Story, but I think you and some other bloggers pointed out some problems in the plot and once I recognized them, they bothered me too. I loved this book and am glad to get your opinion on it. It also deals with some weighty topics and while I didn't see any problems with how Jackson handled them, I was curious to hear what everyone else would think! I'm glad you enjoyed this one :) The quirky characters were what really made me love it too!